A smooth return to winning ways for Peterborough Phantoms came complete with a first shut-out of the season for star netminder Janis Auzins last night (September 26). The formidable Latvian last line of defence dealt with all 22 shots he faced during a 3-0 success over Bracknell at Planet Ice. That was no mean feat against a Bees outfit who lit the lamp 10 times in their previous outing (albeit against struggling English Premier League newboys Hull). They could find no way through against the city men though with Phantoms in command after a quickfire double-salvo in the opening period which paved the way for a solid rather than spectacular success. 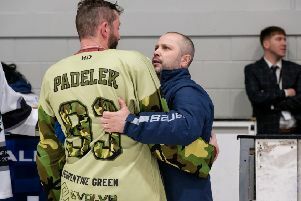 “Bracknell are always a tough team to play – even when they were at the bottom of the league last season,” said Phantoms coach Slava Koulikov. “You have to expect a scrappy game against them and that was the case against last night. “We had guys playing smart, working hard and covering a lot of ice to close out the win. Darius Pliskauskas earned and converted the penalty shot which provided the Phantoms breakthrough when short-handed at 9:03 and the lead was quickly doubled when defenceman Jason Buckman’s drive had the beating of Bracknell netminder Alex Mettam 40 seconds later. There might have been three goals inside a minute had Marc Levers not steered the puck wide from a good position seconds later before Auzins preserved the advantage with big saves from visiting player-coach Lukas Smital and Vanya Antonov. The second period certainly wasn’t short on action at either end, but there were no changes to the scoreline which meant Phantoms still had work to do in the final session. The clincher they required arrived just 61 seconds after the restart as Levers bundled in during a scramble in front of the Bees net. There was little else to report other than a one-punch win for Bees man James Galazzi over Greg Pick after they had dropped the gloves (a roughing penalty for the Phantoms man seemed rather harsh in the circumstances!) and a fine one-on-one save from Auzins to deny Smital and preserve his clean sheet. Phantoms can expect to have to negotiate plenty of tougher tests in the coming weeks and months, starting with a visit to struggling champions Telford tonight (6pm). The big-spending Tigers suffered their third defeat of the season in Milton Keynes last night. They have also lost both home games to date. Koulikov added: “I have said many times that I feel Telford will be the top team again this season.